Frozen Eli's Original Plain Cheesecake on a stick, hand-dipped in rich bittersweet chocolate, topped with an orange drizzle and finished with a sprig of green (green sprig is non-edible). 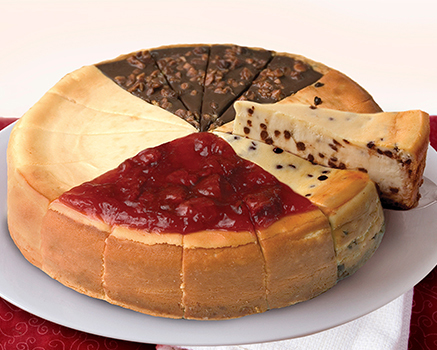 Frozen: Elis Cheesecakes can be stored frozen at zero degrees (0F) for up to 9 months, tightly wrapped. Cream Cheese (Pasteurized Milk and Cream, Cheese Culture, Salt, Carob Bean Gum, Guar Gum), Chocolate Coating (Coconut Oil, Sugar, Chocolate, Cocoa, Nonfat Milk, Soy Lecithin as Emulsifier and Vanilla), Sugar, Sour Cream (Cultured Nonfat Milk and Cream, Corn Starch, Whey, Guar Gum, Carrageenan, Carob Bean Gum, Enzymes), Vanilla Candy Coating Yellow (Sugar, Partially Hydrogenated Palm Kernel Oil, Reduced Mineral Whey Powder, Milk, Nonfat Dry Milk, Soy Lecithin, Salt, FD&C Yellow #5 Lake, Artificial Flavor), Wheat Flour, Egg, Butter (Cream, Salt), Powdered Sugar (Sugar, Corn Starch), Soybean Oil, Modified Corn Starch, Vanilla Extract, Egg Whites, Salt, FD&C Yellow # 6, Soybean Oil, Soy Lecithin. Contains Wheat, Milk, Egg and Soy. Manufactured on equipment that processes Peanuts and Tree Nuts.